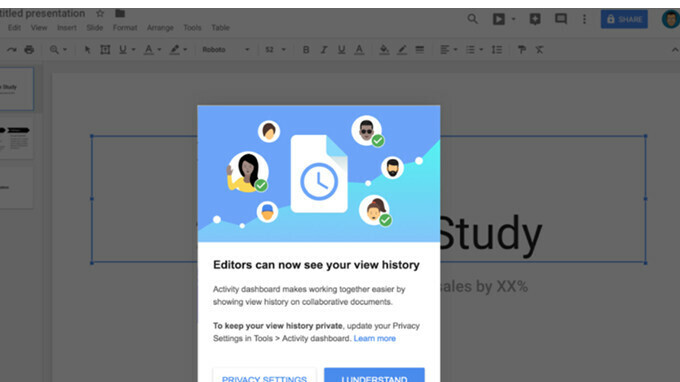 G Suite has just received a major update that brings users the so-called Activity dashboard in Google Docs, Sheets, and Slides. The new feature is meant to allow users with edit access see who has viewed a certain file and when they viewed it. According to Google, G Suite admins will benefit from the new Activity dashboard controls and have access to new Admin console settings starting March 7. Furthermore, end users will see Activity dashboard in Docs, Sheets, and Slides beginning March 21. If you're using G Suite, you'll see a notification in Google Docs, Sheets, and Slides that explains the feature their control options when Activity dashboard becomes available to you later this month. It's also worth mentioning that you will only get to view data for a user after they see the notification. The app will not display any activity from before they saw the notification. On top of that, Google will make available a set of privacy settings to anyone with access, which will allow them to control whether their views show up in Activity dashboard at any time. As expected, this is a gradual roll-out, which means you might not see the new changes right away, but end users should get them by April 9 at the earliest.